Casper’s Story begins in the winter of 2015/2016, during our first few months at Ballynoe House; the same season that the Irish & UK met offices decided to name storms. To celebrate, Mother Nature sent us one storm after another. There was also the little storm who came to be named Casper. Born sometime earlier in 2015, he was no doubt part of litter to a local feral farm cat. The first things we noticed, gliding past the patios doors on the dark stormy nights, were a ghostly pair of short white legs followed by a pair of longer white stockings that clearly belonged to a black cat. We had assumed he belonged to a neighbour and we were just on one of his routes. We referred to him as “Sox”. 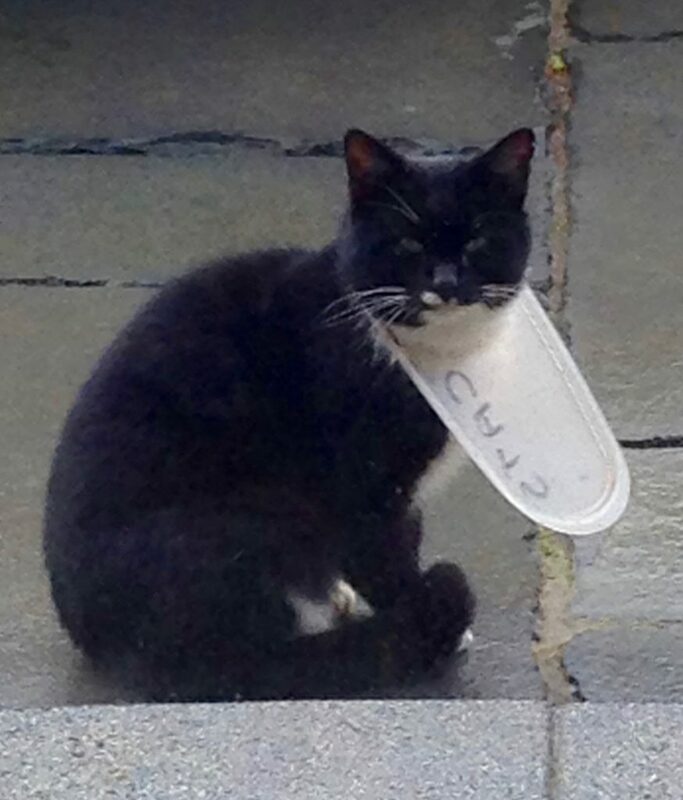 Then, one day in February 2016, we saw him wearing a Tupperware lid around his neck labelled “CATS”. It seemed his scavenging had led him to raiding someone’s cat food supply and trouble. A neighbour may recognise their handwriting and missing lid. Fortunately his “badge of shame” was quite loose and he didn’t appear to be too bothered by it. Resigned, perhaps. Life was clearly a struggle. He was having some difficulty in feeding and cleaning himself, as his coat was dull, brown and patchy. We waited a few days, thinking his owners would take the lid off, but it remained. Despite our best efforts to get close enough to remove the lid ourselves, it was clear he was feral. Food was coaxing him closer, but he would stay many metres away until we were inside the house behind closed patio doors. After a week or so, we arranged for the local Cat Defence League to set a trap with food so that he could be rescued. Job done, with the help of some stinky sardines. A vet’s visit made sure he was checked out, neutered and had all his shots. He was released back in the garden of Ballynoe House. Efforts to send him on his way were unsuccessful. Despite the trauma of capture and the vet’s visit, he parked himself outside the patio windows and refused to budge. We decided to adopt him and named him Casper. As he was feral, he was fed outside. 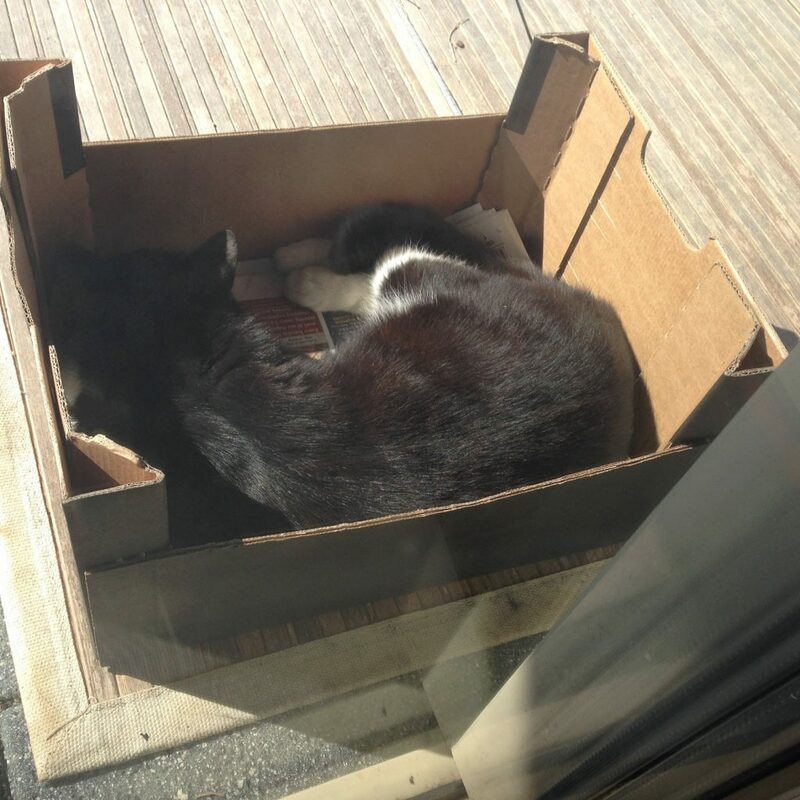 His first home was a box, which was upgraded after a time. His trust increased gradually, to the point hands were less at risk of being savaged. Over the next year he had been socialised and is accepting of his new family, but remains wary of strangers. He is allowed in the house under supervision, but as soon as night time falls, his eyes turn big and black. Like Mr Hyde, he switches to his wild side and has to be released back into the garden – At least until it is time for breakfast. He has almost (when not tempted to claw the carpets) learned what it is to be a domesticated cat. 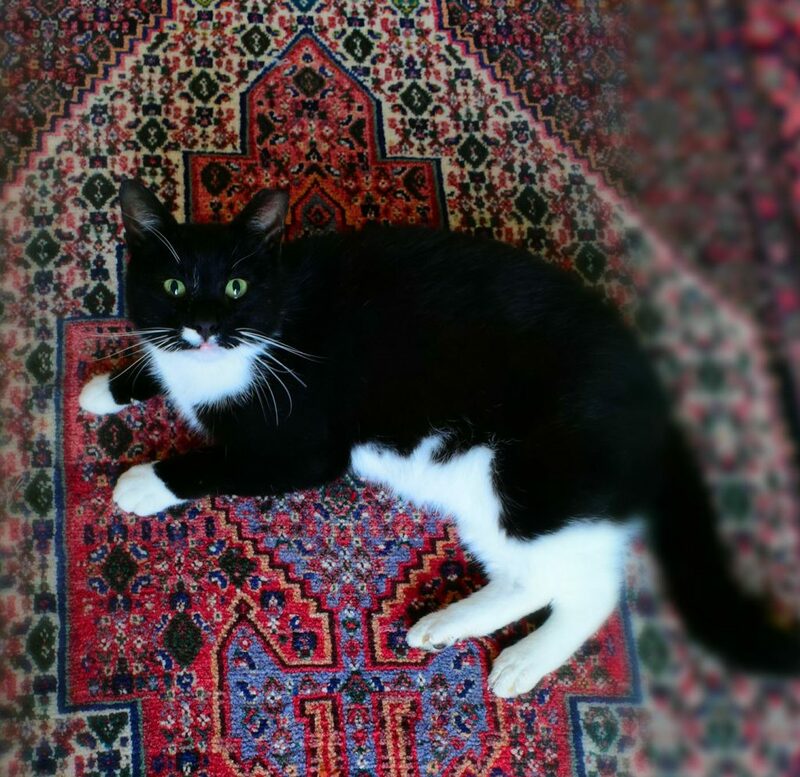 For the most part, with his tuxedo, Casper is now a gentleman of the house.